Here in this article we are providing you RBI Grade B officer Previous Year Questions papers which may helpful in your preparation for the examination. 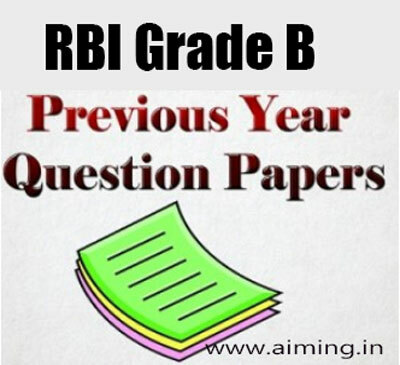 Here you can download the RBI Grade B Previous Year Question Papers in PDF format only. Every year Reserve Bank of India conducts RBI Grade B Exam to select the candidates who are eligible for the position of Grade B officer. And RBI will appointed them its various branches all across the country. And the RBI offers a reputed job profile and excellent pay scale. That’s why every year thousands of candidates take this examination. Number of vacancies to be filled through RBI Grade B Exam, it is really important to prepare effectively for this exam. Typically the RBI Grade B exam is conducted in three phases. The Candidates those who clear all the three phases in will get a confirmed post as a Grade B Officer in Reserve Bank of India. The first phase of RBI Grade B exam is known as Prelims and the second phase is known as Mains. It is the first and important stage of the examination, and the duration of the Prelims phase is two hours. Total 200 questions will be asked in this phase of examination. It is the second stage of the examination, and the duration of the Mains phase is 270 minutes. Total 300 questions will be asked in this phase of examination. The Interview Process is the final stage of RBI Grade B examination. Based on aggregate marks obtained in Paper-I, Paper-II and Paper-III of Phase II exam, candidates will be shortlisted for the interview. This stage will carry 50 marks. After successful completion of interview process the candidates will appointed into their positions by the Reserve Bank of India, some of the departments that may be allotted are Financial Markets, Banking Supervision, Banking Regulation, Currency Issuing, Public Debt Office, Foreign Exchange, and HRD etc. Those who want to get RBI Grade B officer job need to qualify the examination. For this, one must adopt new strategies and methodologies for better preparation of their exam. One of the best way is to solve daily RBI Grade B Previous Year Question Papers. RBI Grade B Sample Papers with Answers helps you in strengthen the preparation level. Here are some of the benefits of RBI Grade B Officer Old Questions papers. Applicants will get idea about the exam structure, with the help of RBI Grade B old model papers. Through RBI Grade B Previous Question Papers, participants will know about the types of questions asked in the examination. By practicing with RBI Grade B model papers will boost up knowledge. These papers will also improve efficiency and accuracy level of the exam preparation. Here we are providing you RBI Grade B Officer Previous Year Question Papers. You can download the Question Papers and can share them with your friends. If you want any more information related to RBI Govt Jobs Recruitment please visit the official website i.e. www.rbi.org.in.